The background is a small sample of what I've been creating lately. It is taken from a photograph that I took with my cheap digital camera while out walking with the dog. I altered it. The maudlin verses stuck themselves on there as I was reviewing my day. I was unable to get out of the house today. 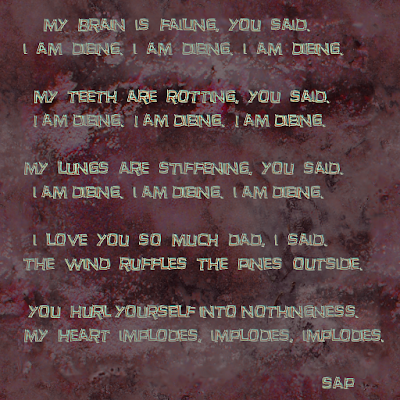 So I worked on textures and wrote bad verses instead. It has not been easy, this waiting for death. My dad's Lewey Body Dementia continues its' wayward course. Some days are clearer than others. Physically he is weaker now. My own tears lay just beneath the surface. Meanwhile, life continues to pass us by. His ex-wife, financially destitute from condo living, is considering a move to a warmer climate. My half-sister is traveling around the country with her new job. Time stands still as Death courts my dad. Together, we squeeze what joy we can out of whatever time we have left.